If Billy Steel’s move to Derby, and even more so the one to Dundee came as shocks, imagine the gasps that reverberated through the game when the next payment to take the British record was made by a club in the third tier. 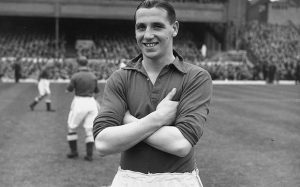 TOMMY LAWTON had already earned a place among England’s greatest marksmen when in 1947, in his prime at 28-years-old he left Chelsea, who had paid Everton £14,000 for his services, to sign for Notts County of the Third Division (South) for an estimated £20,000. Lancastrian Lawton went to Castle Hill School in Bolton where he was followed at centre-forward by another future England marksman in Nat Lofthouse. He started his senior career at Burnley in 1935. On leaving school Lawton was chased by a number of clubs and he originally signed for Sheffield Wednesday but his family stepped in and vetoed the move. The deal to sign at Turf Moor also included a job as an assistant groundsman for his grandfather and a rent-free home for the family. He made his debut for the Turf Moor club as a 16-year-old in March 1936, and scored twice on his second appearance, a crucial 2-0 win for his relegation-threatened team over Swansea at Vetch Field. As he would recall years later, the new star allowed to enjoy his success. “I had just settled down to think about giving myself a nice pat on the back when another player in the team, a bluff north-countryman pulled me up with a jerk,” Lawton recalled. ”Don’t think too much of thyself”, Lawton was told. “Tha’ve a long way to go and a lot to learn”. Learn he did, and quickly. Not long after, he scored a hat-trick against Spurs days after his 17th birthday and within nine months Everton had splashed out £6,500 for his services. At Burnley he had already shown huge promise, scoring 16 goals in 25 games and the move to Goodison saw him come under the wing of the legendary Dixie Dean. The record breaking single-season scorer famously and magnanimously said when the youngster arrived; “I know they’ve bought you to replace me, I’ll do all I can to help you”. The pair enjoyed extra, afternoon training sessions together working mostly on aerial ability where as Dean later said; “I was pleased to see Tom had the right idea in the air. I impressed on him the value of this asset to a centre-forward”. 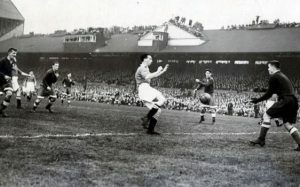 In the lead-up to the Second World War, Lawton became the country’s top marksman, finishing as the First Division’s leading scorer for two seasons including in 1938-39 where his 35 goals helped Everton land the title. He made his England debut as a 19-year-old in 1938, scoring in a 4-2 loss to Wales. He netted in each of his first six games for his country and was clearly the country’s leading centre-forward when top-class football came to a halt and the war took over. 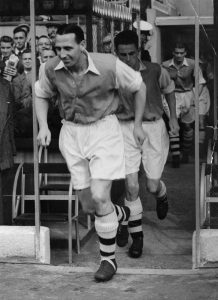 During the war Lawton worked as a training instructor attaining the position of Company Sergeant Major whilst turning out for Everton and as a guest player for Aldershot, Leicester City, Tranmere Rovers and Morton (he also made an appearance for the Scottish League). When the fighting had come to an end so had Lawton’s first marriage and he requested a transfer from Everton to help deal with separation from wife Rosaleen who he had married in 1941. Everton reluctantly agreed to the request and he moved to Chelsea for £11,500. Early on in his Chelsea career he played in the famous friendly match against the Russians of Moscow Dynamo, scoring the home team’s final goal in the 3-3 draw. He continued finding the net regularly, scoring 30 times in 42 games for the Londoners and twice for Great Britain in a match against The Rest of Europe before falling out with the club after asking to be excused from a Scandinavian tour. Lawton submitted another transfer request. Chelsea agreed ‘under protest’ and he was on the move again. 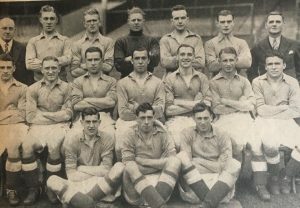 The fee was slightly deferred as Chelsea handed over a cheque of their own, paying £3,000 for Irishman William Dickson who would make over a century of appearances for the Londoners. When it was announced that Chelsea would sell their star man, clubs up and down the country scrambled for their cheque books. Lawton’s decision to join the Meadow Lane club was made mainly because of a man called Arthur Stollery who was County’s manager at the time. Stollery had been the physiotherapist at Stamford Bridge and the two were close friends. When he was sacked Lawton is said to have agreed that he would play for whoever Stollery joined. 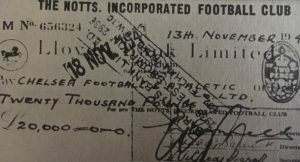 Lawton was a firm believer that footballers were underpaid (the maximum wage was still in force of course) and there was much talk that he received a hefty amount when signing for County. The centre-forward remained at Meadow Lane for four seasons helping them to promotion as champions of the Third Division (South) and scoring close to 100 goals. 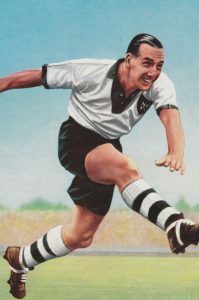 He also became the first 3rd Division player to be chosen for England, making his final start for his country against Denmark in 1948 and finishing his international career with 23 caps and 22 goals. 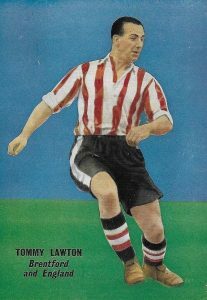 By 1952 Stollery had left Notts County and Lawton was sold to Brentford for £16,000. He was appointed player-manager at Griffin Park initially but after criticism from fans stepped down from the managerial role. Nine months later he moved again, this time it was back to the big time, joining reigning champions Arsenal for £10,000 at the age of 34. It was the third time the North London club had tried to buy the forward and they finally got their man. After retirement Lawton fell on hard times. Having spent his entire career earning only the maximum wage he certainly didn’t retire with the riches that today’s stars enjoy. That he was not thought of as a true ‘great’ by any one set of fans was mostly because of the many, mostly financially-driven moves he made throughout his career. But looking back at his playing time as a whole, one in which he lost six prime years due to World War Two, Lawton has a worthy claim to be classed as one of the greatest number nines England has produced. 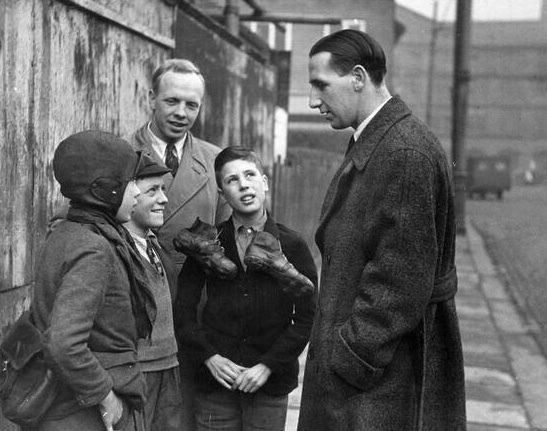 Tommy Lawton passed away in Nottingham in 1996 aged 77.